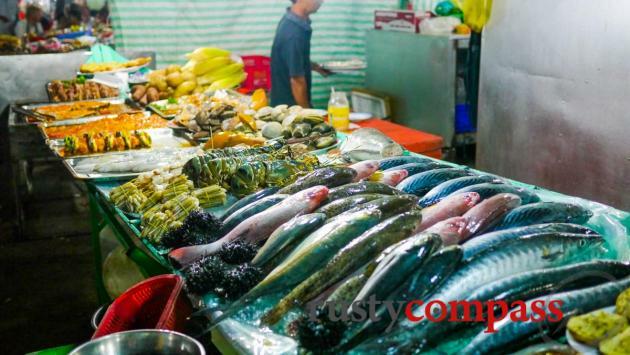 An independent travel guide to Phu Quoc Island with candid reviews and recommendations. No sponsored content, no advertorial. 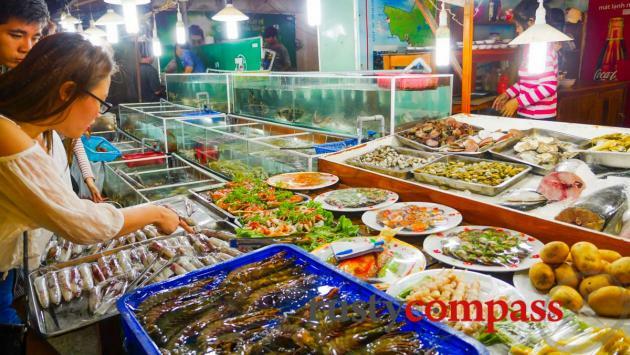 Phu Quoc night market for dinner. 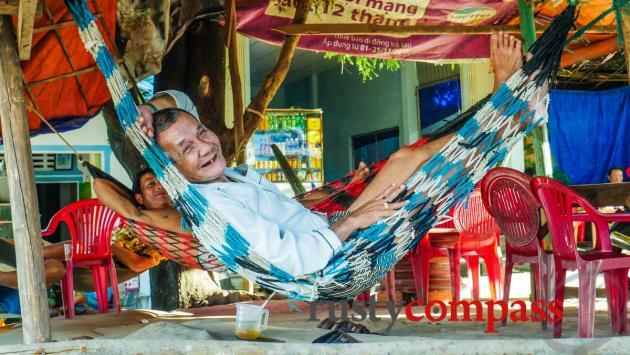 OUR PHU QUOC GUIDE WAS LAST UPDATED IN 2015. THERE HAVE BEEN BIG CHANGES SINCE OUR LAST VISIT. TOO BIG PERHAPS. WE'LL BE RETURNING IN 2019. STAND BY FOR OUR UPDATE. Phu Quoc is Vietnam’s largest and most beautiful island. It’s home to some of the country’s most picturesque beaches. A long anticipated tourism boom is starting to hit Phu Quoc Island, with new resorts going up at breakneck speed. Some of the island's blissful serenity is slipping away. There are plenty of mediocre developments too. But if you choose the right place to stay (check our handpicked list of hotel and resort recommendations here), Phu Quoc’s still a great escape from the intensity of Vietnam’s cities. 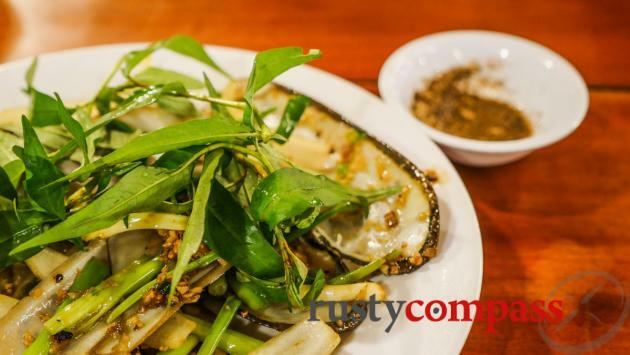 There isn’t a whole lot to do on Phu Quoc apart from relaxing, swimming and enjoying the fresh seafood. Travellers once delighted in exploring the island’s red dirt roads by motorbike. The roads are now sealed but increasing traffic, including large trucks and the development of once remote beaches, has taken some of the edge off island exploration. Like most of Vietnam’s popular beach spots, Phu Quoc looks set to focus on large-scale mass tourism - that means golf, casinos and huge resorts (there’s already a 27 hole course). 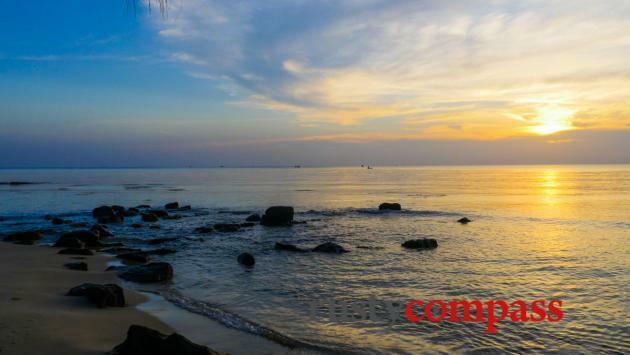 Two favourite Phu Quoc beaches, Bai Sao and Bai Kem have been earmarked for massive development. Construction has already commenced on Bai Kem. 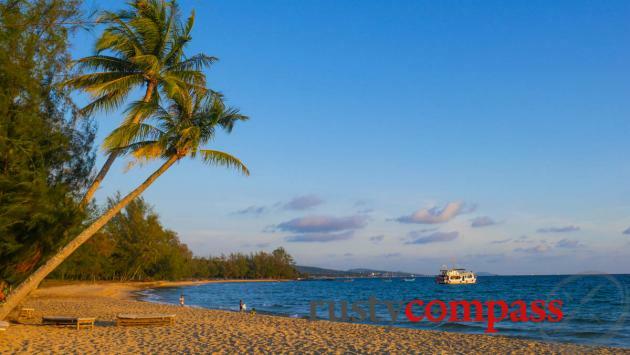 They’re no long must-see Phu Quoc beaches. In the north of the island, a huge swathe of land has been allocated to Vingroup, a developer with a penchant for large, imposing resorts, fun parks and golf courses. The resort and golf course are already open. The possibility of more restrained and environmentally friendly development seems not to have occurred to those running the island - who seem similarly disinterested in clearing up the piles of plastic that accumulate on many beaches. 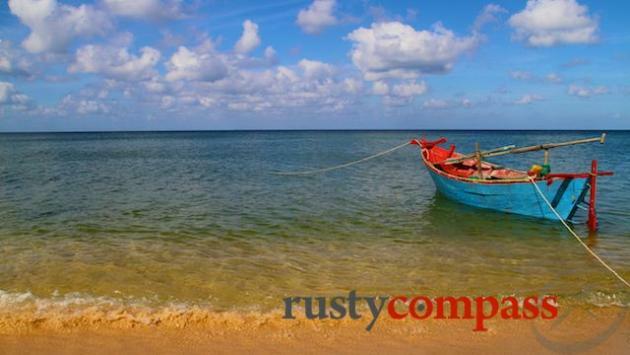 Phu Quoc sits just 18 kilometres off the Cambodian coast and about 45kms from Ha Tien on Vietnam’s mainland. The Cambodian mainland is clearly visible from the northern tip. The island played a modest part in Vietnam’s imperial past when Nguyen Anh, an heir to the powerful but besieged Nguyen clan, took refuge here during the late 18th century Tay Son rebellion. When he successfully fought back against the rebels and unified Vietnam, Nguyen Anh became the founding emperor of Vietnam’s final dynasty, the Nguyen dynasty. He assumed the name Gia Long and established the royal capital in Hue. His dynasty ended in 1945 with the abdication of Bao Dai in favour Ho Chi Minh’s communists. In the past, Cambodia has made claims on Phu Quoc, in part on the basis of territorial proximity. 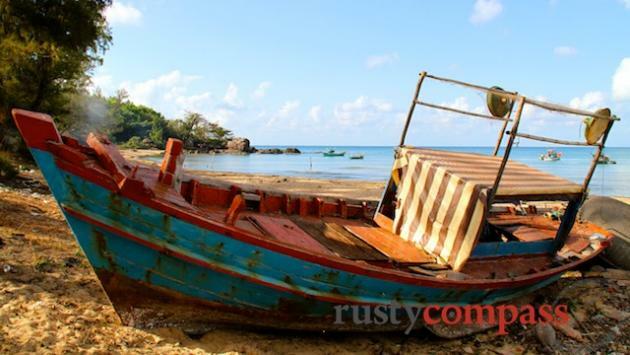 Residents of the Cambodian city of Kep look jealously across the island from their beaches. Vietnam’s presence is well established however and dates back centuries. During the Vietnam War, Phu Quoc became a prison for enemies of the US-backed South Vietnamese government though its prison days are less widely known than those of Con Dao, Vietnam’s other prison island. Phu Quoc Island is located to the west off Vietnam’s southern tip - directly off the Cambodian coastline. Most travellers to Phu Quoc arrive by plane from Saigon at the island's increasingly busy airport. There are also direct flights between Hanoi and other major cities. There are now loads of flights each day and fares are usually competitive. There are a small number of international flights operating to Phu Quoc and there are big plans for increased international access. For those travelling to or from Cambodia, or Vietnam's Mekong Delta, multiple ferries operate each day between Phu Quoc and the Mekong Delta cities of Rach Gia and Ha Tien. Rach Gia is around 90 minutes by road from the Cambodian border. Ha Tien is just 30 minutes from the Cambodian border. 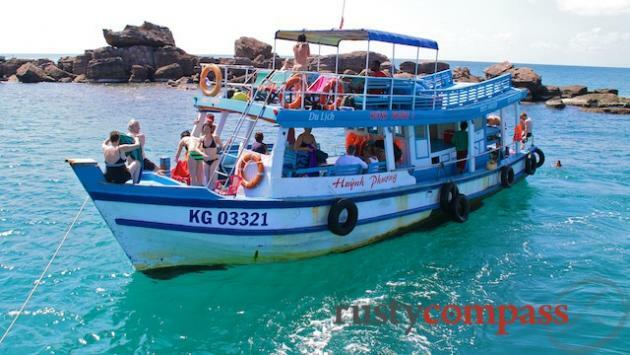 This can be an interesting way to get to Phu Quoc. They’re comfortable seaworthy craft - we’ve travelled the route on many occasions now. 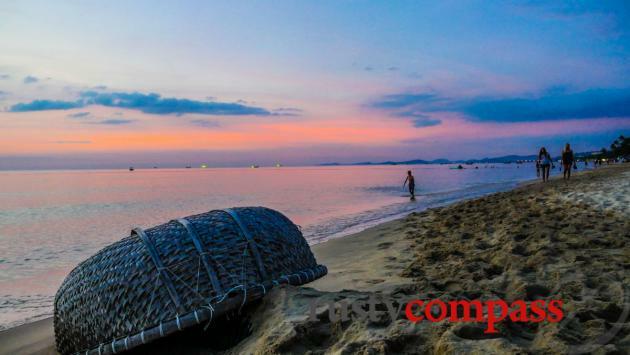 Most travellers to Phu Quoc Island will spend some time exploring its remote beaches and national park. The island is changing fast and things that were remote just a few years ago may now be host to a giant construction project of a shiny new resort. There's a lot of work happening so the romance of exploration is not what once was and there are lots of trucks on the road too. If you're not licensed to ride a motorcycle you are probably breaking the law and invalidating your travel insurance by jumping on a bike on Phu Quoc. Officials often crack down on unlicensed riders as well. Local xe om (motorcycle taxi) riders offer tours of the island. Taxis are also now widely available and there are an increasing number of tours offered as well. As road improvements continue, bicycles are becoming a more practical mode of transport. Bicycles are widely available. Boat trips to the outer islands for snorkelling and diving are organised along Long Beach. Motorcycle accidents are probably the biggest health and safety hazard on Phu Quoc. Violent crime and robberies are rare. A small number of travellers may encounter problems diving or snorkelling but the island's waters are safe most of the time. There is a basic hospital facility on the island. Travellers requiring higher level treatment will need to return to Saigon or evacuate to Singapore or Bangkok. VINMEC's hospital is probably the best place for foreigners seeking treatment. 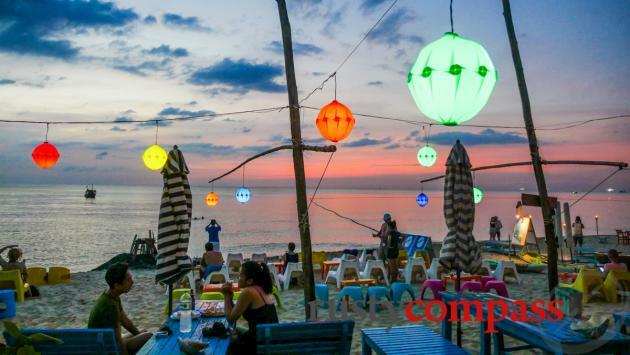 Most hotels, restaurants and cafes on Phu Quoc Island offer free wifi internet access. Major Vietnamese telephone carriers also offer stable 3G and 4G services in the main centres on the island. ATMs serving foreign banks are also readily available on Long Beach, Duong Dong town and An Thoi town.